Do you know how to calculate the exemptions correctly AND allocate the money correctly between the creditors? Support order garnishments take precedence over general judgment garnishments, and income withholding orders take precedence over both; and where do tax liens and defaulted student loans fit in? It is not just a matter of dividing the money equally. If you make a mistake, it could mean your company would have to pay fines and penalties! Don't let that happen to you! Save time and money by using our Kansas Court Withholding Program to calculate the proper deductions and allocations for you--it will cut the time needed to calculate each payroll and you won't have to worry about whether the allocations are in compliance with the Federal Consumer Credit Protection Act. Not only are the deductions and allocations calculated correctly, but the Kansas Court Withholding Program also prepares and prints answers and distribution statements for you to send with each payment. or we can mail you a PowerPoint program on CD. 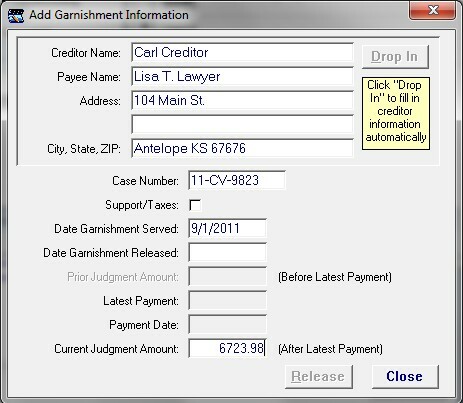 The NDF Kansas Court Withholding Program is for use by employers, payroll accountants or anyone who needs to calculate Income Withholding and Kansas Chapters 60 & 61 continuous Earnings Garnishment withholdings in compliance with the Federal Consumer Protection Act restrictions and to distribute withheld amounts to payment centers and garnishing creditors. For a printable trouble-shooting guide for the Kansas Court Withholding Program, click here.